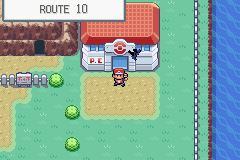 This is an unofficial addendum version of Pokémon Throwback, which is a hack created to serve as the definitive version of the original Kanto journey. 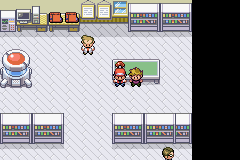 Based off of Pokémon FireRed, Throwback includes a bevy of features and fixes to make it worth using over the base games. Pokémon Throwback was originally developed by RichterSnipes and you can find his official version here. There are 2 versions of this unofficial Pokémon Throwback by tkim. One only includes bugfixes and otherwise is very similar to the last release by RichterSnipes. The other also includes a number of improvements and changes. Both are included in the download. A GB Player item allows for players to hear the original 8-bit music in the game, as well as switch between it and the standard FR/LG music at any time. Reasonable Pokémon placement throughout the game - taking cues from all iterations of the first generation games, including Yellow and Japanese Blue - ensures that all Pokémon from the first two generations are obtainable through official-esque means (including canon evolution methods). The main characters now wear clothing similar to their initial depictions in the original games and related media. All text has been decapitalized in a manner consistent with the most recent games. TMs and move tutors are infinitely reusable. Various bug fixes for the original game. Trees only need to be cut once, you can run indoors, several more items are now obtainable within the game, many “tutorial” moments from the game have been removed, and much, much more! Note that the title of the hack in-game is simply Pokémon (subtitled “Pocket Monsters” in the credits). This is because the game within is an updated edition of the original adventure from 1996 (1998 internationally) and is version-agnostic. GB Sounds’ function has been altered to behave more natively to the 3rd Gen handheld games. Fanfares played will be more in-tune with the 3rd Gen handheld games, including two fanfares (though inaccurate) from the 2nd Gen handheld games. Music played during Link Battles will now play the standard Kanto trainer/gym leader battle theme. 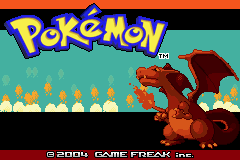 All 251 Pokémon from the 1st and 2nd Generations can be caught without an external save file. Faraway Island is accessible and located near Two Island. Celebi will join the player’s Party, if able, after Entering the Hall of Fame for the second time. Navel Rock and Faraway Island will show up on the Town Map by default. Pokémon sent through Bill’s Teleporter will evolve, if able, as if they were traded away to another player, including consumption of held items such as Metal Coat. The Stats Judge will appear outside of the Trainer Tower post-game. The Hidden Power judge will appear inside of the Prize Exchange in Celadon post-game. 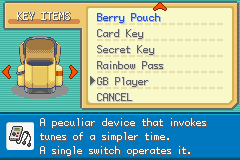 Lostelle will give out a rare Berry such as EV-lowering Berries every time the player enters the Hall of Fame post-game. Pokémon Marts will give away Premier Balls with every purchase of 10 Poké Balls or more in a single transaction post-game. Volt Tackle can now be learned by breeding within the Pikachu family holding a Light Ball. Flame Body and Magma Armor Abilities will now reduce Egg cycles by half. The Celadon Mansion will now be referred to as the Celadon Condominiums or Condominiums. Both versions of tkim’s patch are included in the .ZIP file, one with only bugfixes to RichterSnipes’s original patch, and the other that also has all the optional improvements and changes tkim added. 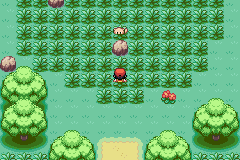 A discussion thread for the development of this hack is on the website PokéCommunity here. Apply to an unaltered Pokémon FireRed version 1.0 USA Game Boy Advance ROM (the “Squirrels” ROM has the correct checksums).